Reliable, accessible modes of communication are critical for any organization, especially in the time-sensitive realm of science. 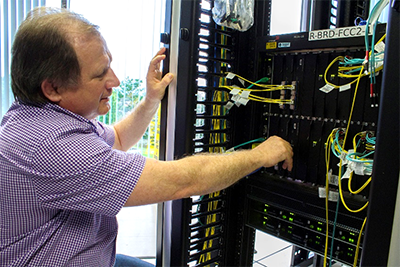 The Core Computing Division’s high-speed network, email, video conferencing and telecommunications services are essential for the success of our experiments. These services enable scientists to collect data, analyze results and share findings. Our networking and communications team provides the resources necessary for all lab users to share information across Fermilab’s 6800-acre campus, between Fermilab and our far detectors in South Dakota and Minnesota, and to our international research institutions and partners. To provide these services, Computing supports 4000 phones, 11.5 million minutes of conferencing annually, 75 conference rooms and the critical paging and radio systems for the fire department, security, etc. We support over 11,000 Fermilab email addresses, 2,800 mailboxes and 5,000 mailing lists. 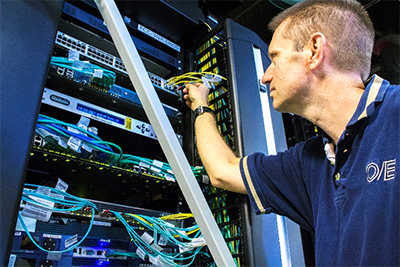 Networking enables the transfer of 50 petabytes of internal information a day across thousands of miles of network cabling. Our high-speed, campus-wide network has the capacity to support the daily needs of the lab and the influx of visiting scientists and students for conferences and summer programs.